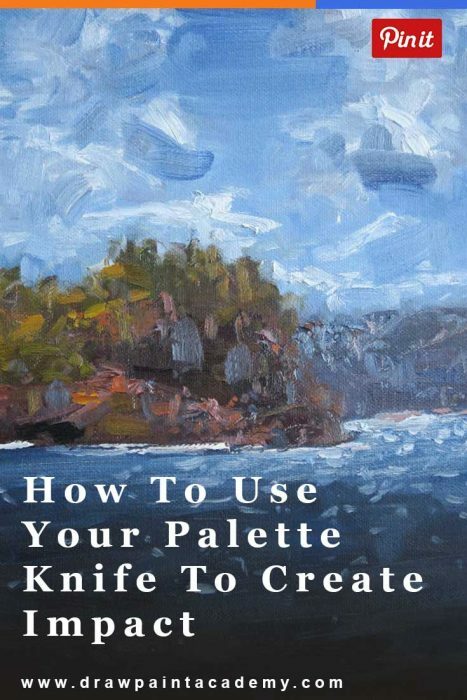 I am sure most of you are aware of what a palette knife is, but for those of you who are not, it is basically a tool used in acrylic and oil painting for mixing paints and applying paint in a thick, impasto manner onto the canvas. What I wanted to discuss here was using a palette knife to draw even more attention to your focal point by creating an interesting contrast between the sharp, bold strokes of the palette knife and the relatively softer strokes of a paint brush. When beginner painters become aware of the fantastic painting properties of the palette knife, they will often launch into an impasto painting frenzy on the canvas, completely ignoring the brush all together. Whilst this can be a great and extremely satisfying way of painting, the palette knife in my opinion is much more effective when used selectively in combination with the paint brush. As I always like to say, contrast is everything in painting. You can create contrast in many ways - contrast in colors, contrast in strokes, contrast in temperature and so on. Without any contrast, your painting will be nothing but a blank canvas. Here I want to focus on the contrast in texture using the palette knife and paint brush. So we have discussed what you can do with a palette knife and the interesting textures you can create, but when exactly should you be using these techniques? I find one of the most powerful methods is to use the textures created by the palette knife to enhance and draw attention to your focal point. The focal point is where you want to eventually draw the viewer's eye towards. The more dominance and strength your focal point has relative to the rest of the painting, the more powerful it becomes. It is all about relativity. Sure, the palette knife can create bold and powerful textures, however if you have used the same techniques for the rest of your painting then your focal point will have no strength. So the key is to contrast the bold and dominant strokes of the palette knife against soft, less defined strokes of the paint brush. Have you ever focused on the background areas of some of the master paintings and noticed there is really not much detail at all? Often times there is nothing more than some seemingly random strokes of color. The reason for this is the artist does not what you do focus on this area. But this does not mean the area has no purpose. Its purpose is to accentuate the focal point, which is an extremely important part to play. Ken Knight is an Australian impressionist painter who makes use of very large brushes and palette knifes and paints in a very fast manner. As you can see in his painting above, Keanes Point, he uses sharp and short strokes of the palette knife to draw your attention to the focal point which appears to be slightly left of centre from a viewer's perspective. These palette knife strokes contrast against the long and relatively soft brushwork in the rest of the painting. I am a big fan of Colley Whisson and the Whisson family in general. They are a family of painters with a great talent for painting landscapes. Colley Whisson paints in a similar style to Ken Knight. In his video below you can see him use the palette knife to add details to the foreground area. Richard Schmidt is one of the greatest fine artists of our time and a big fan of the palette knife. He believes the palette knife is a powerful tool which can create bold and intense strokes unmatched by the paint brush. His paintings appear to utilise the palette knife to create a contrast between soft brushwork and sharp palette knife strokes. He skillfully uses this technique to draw attention to his focal point in the paintings. In particular, his flower paintings show the intense strokes of color capable with the palette knife. I have been practicing this technique in some of my recent paintings. I try not to overdo it with the palette knife, but rather just use it to accentuate certain areas of importance in my painting or areas which warrant the unique strokes of color only capable of being made with the palette knife. 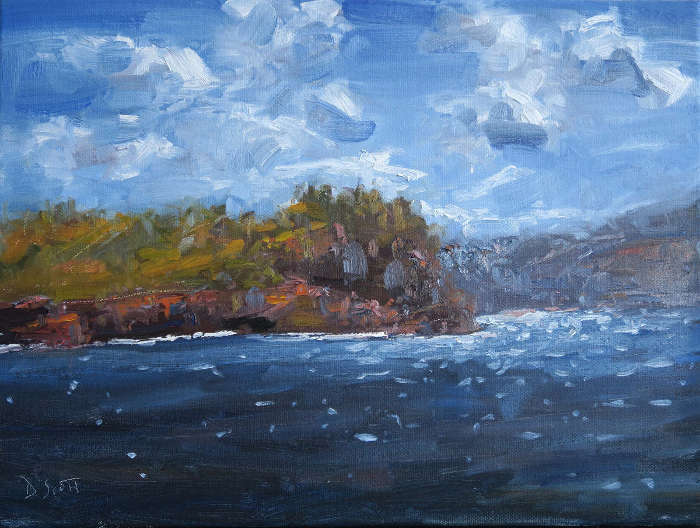 In my Sydney Waters painting I use the palette knife for the areas around the edge of the nearest land (my focal point). The palette knife helps create rough textures on the rocks and add sharpness in contrast to the soft brushwork used in the rest of the painting. What can you take away from this? Well if you are not using the palette knife at all, then experiment with it and try using it to influence where you want the viewer to look. If you use the palette knife already, then I would love to hear your thoughts in the comments. Do you use it throughout the whole painting or just in certain situations to compliment the rest of the painting? Great to hear Norm! Yes please send an email with a pic. That was a very useful video and information. Will try using the palette knife myself as l really like the effects. Glad you found it useful Lisa. I even didn’t had a palette knife in my tool stack yet. But after reading and watching i really wanna go an buy one. Hi Malu. You certainly should! It is a very useful tool, if only for mixing your paints.